StudentsNepal.com is the first and largest community website for students of Nepal with 9,700 registered members and 50,000 subscribers. The site helps students find answers to popular courses and colleges by acting as a bridge between the students and educators/educational organizations. I started working on this side project in December 2014. I remembered I had very little information about courses and colleges I could choose from after finishing Higher Secondary level back in 2011. There were no websites that could readily help students to explore the various opportunities available in Nepal. There are still a lot of students in Nepal who have been brain-fed that studying abroad is the one and only option to be successful. My vision was to change this mindset among the young students of Nepal by informing them about the abundant opportunities and options available within the country. The goal for creating StudentsNepal is to increase communication among different students with different educational backgrounds while helping them to learn all sorts of information and get hold of educational resources. Communication and interaction are the core values of StudentsNepal and these are the features that help the platform stand out from rest of the educational websites. BuddyPress and bbPress have helped us to achieve these values in a cost effective and efficient way. The beauty of these plugins is that our members can create content and help to rank us higher with search engines. The investment to create StudentsNepal.com was very low, a fraction of my pocket money during my final years in college. It is now one of the top educational portals of Nepal. Since WordPress was so easy to master, my dev team and I were able to use most of our free time to create initial content and other valuable resources for our visitors – students, parents, and educators – rather than spending time/money coding from scratch or buying a proprietary platform. 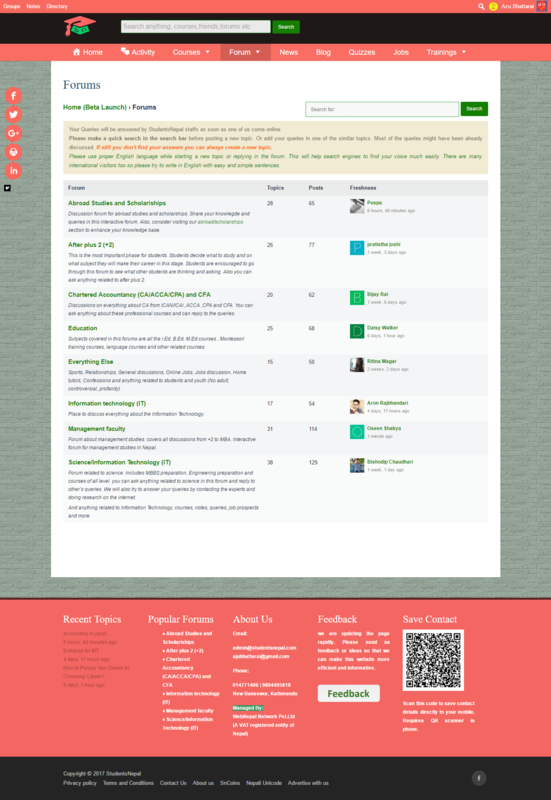 Before choosing BuddyPress, I researched open-source social network scripts and platforms. My shortlist included WordPress (BuddyPress), Joomla (JomSocial), and Drupal (social modules). It was clear to me, after reading a lot of support forum posts and articles, that the BuddyPress/WordPress combo was the way to move forward with my dream. I am really happy about this choice today. The other heavyweight plugins that I added were GravityForms, Sucuri, bbPress, and MyCred plus other smaller plugins for specific tasks. We found out that the default login and registration pages made it difficult for members to log in and have kept site visitors from registering. We resolved the issues by installing the Gravity Forms plugin and adding log in integration via Facebook, Twitter, or Google+ as well as making the registration page more user-friendly. I thought about adding a newsletter because I loved the way some of the blogs I subscribed to sent organized information and recent activities of the blog in a beautiful email format. I decided to add an optin form to start collecting names and emails 2 to 3 months after launching the site. During the first 6 months, only first names and emails were collected with the popup optin form. Later, I changed the optin forms to collect email addresses and phone numbers. I have been using the free package of mailmunch for optin forms (popups) and Amazon AWS for sending newsletters. The newsletter contains scholarship notices for different universities/colleges, student stories, youth events, and other useful academic information. The newsletters have become one of the most popular features for the community. We did a lot of testing for the positioning and timing of the popup to get the most sign ups. StudentsNepal had around 20,000 subscribers by the end of 2015. The number of subscribers started growing after I inserted the forms in all the subdomains. (news.studentsnepal.com, jobs.studentsnepal.com, quiz.studentsnepal.com, blog.studentsnepal.com). After 3 years, the site has 50,000+ subscribers. Currently, StudentsNepal sends 1 newsletter per week, and my dev team and I are planning to make it 2 newsletters per week. We had invited students and educators/institutions to contribute content for the newsletters and the response has been just great! Students, particularly, submit generously and regularly to benefit other members, subscribers, and online visitors. In addition, this project has also helped me connect with lots of awesome individuals and similar-minded startup owners. Out of the box, BuddyPress has a plain and simple design and interfaces which can be customized easily. At the end of the day, the features and performance are what matters most to my users whether on mobile, tablet, or desktop. For me, due to extensibility and ease of customization, BuddyPress reigns as king when it comes to a free open source script for a social network. StudentsNepal.com was on a shared hosting plan when I launched it in 2014. It took around 3 to 4 months to cross the benchmark of 500 visitors/day. After getting articles indexed in search engines and started getting higher ranks, StudentsNepal started getting a lot of visitors (especially from Google). Mid-2015 we upgraded to VPS hosting when the website’s articles and contents started getting listed on the 1st page of search engines and it started getting a couple of thousand visitors daily. Based on my experience, it’s a good decision to get a shared hosting plan while the site was starting out and then upgrade to more powerful hosting plan when data showed the increases in user engagement and participation. With a community of 9,700 registered members, 50k subscribers, and around 150k visitors/month, I am happy to say that our site runs smoothly with nary a downtime on all devices. If you install BuddyPress, you will need a bit more power on your server. Future plans for StudentsNepal.com include moving the Shopping and Jobs sections to separate domains and setting up a new site for online classes. I am testing Woocommerce, WP Job Manager, and Moodle for the other projects to expand our services to the community. If you are creating a site for any niche community and are not sure on which platform to choose, I definitely suggest using WordPress with BuddyPress. These have a lot of stable and robust add-on plugins to help you create awesome and feature-rich communities. StudentsNepal.com is the first website of its nature in Nepal and it has garnered a lot of media attention and praise. I received a lot of positive and encouraging messages from educators and students in Nepal for creating this platform. I’m just glad that the services provided by the site have been very helpful to so many Nepalese students as well to those who would like to study in Nepal. Arjun Bhattarai is a member of the Association of Chartered Certified Accountants (ACCA) and is currently working towards MA (Economics) at Tribhuwan University, Nepal. Apart from writing and playing with code, he loves swimming and watching sci-fi videos.